In my last post I mentioned that I sometimes include basic grave marker resetting instruction in my workshops. I always get asked about how to repair and/or reset grave markers that are multi sections. That sort of work is beyond what I typically get into, but, I wanted to provide a resource that I find very helpful. 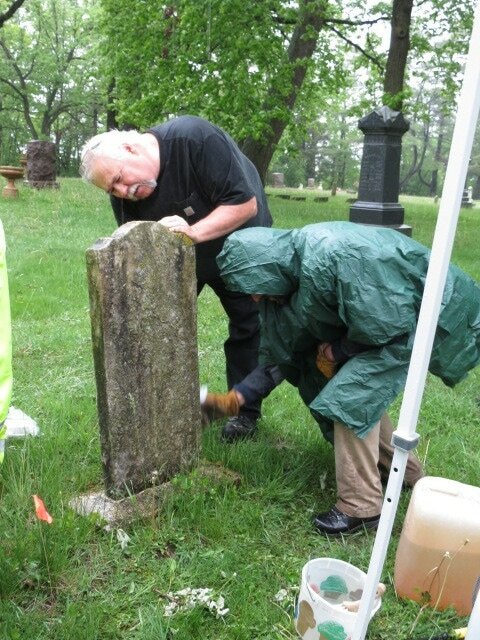 Last year, Jason Church, Materials Conservator for the NCPTT, did a webinar with the Wisconsin Historical Society on resetting grave markers. In this 90 minute presentation, Jason shares a wealth of practical info about how to repair and reset gravestones. I'm providing a link to that video here because it is too valuable to not be shared. I hope you find it useful. Oh, and become a member of the WI Historical Society if you aren't already. When I do workshops I usually include a demonstration on how to reset and/or straighten sinking or crooked gravestones. Although simple in theory, resetting gravestones is actually a tricky practice because 1) gravestones are sometimes "icebergs," 2) gravestones may be broken at the base, and 3) gravestones weigh more than you think. A few summers ago I was hired to raise two slant markers out of the ground that were at least nine inches submerged the bottom line of engraved wording. The first one was easy to reset because the bottom of the gravestone ended just below the engraved portion of it. The second gravestone, however, was a whole different story. That slant marker continued another 18 inches below the the finished base and must have weighed at least 200 pounds! Even though this second grave marker was almost identical to the first in terms of how it appeared above ground, the below ground parts were very different. 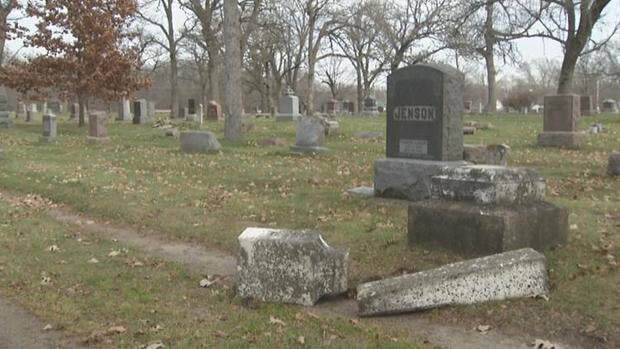 With resetting gravestones, you never know what you will get into so do so with extreme caution. Don't panic! it's supposed to turn pink. So, you've just finished scraping off the lichen and scrubbing the gravestone with water. Now it's time to apply D/2 Biological Solution to kill the lichen and whiten the stone. You spritz some on the damp gravestone and...oh no! Why is the gravestone turning pink?! 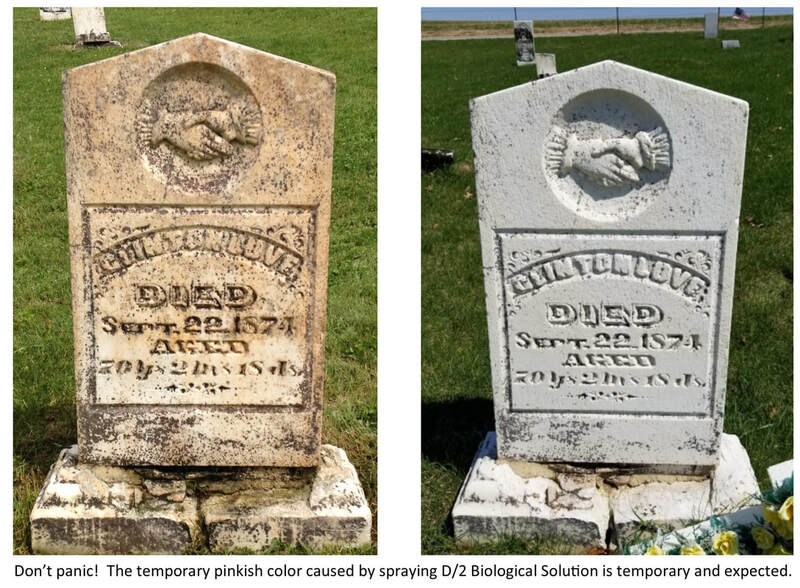 Don't worry--sometimes stone will turn a subtle color of pinkish-orange after applying D/2 Biological Solution. The manufacturers of D/2 explained it to me that the color change is the result of the biological organisms reacting to the D/2. This temporary discoloration can take on shades of orange, pink, or gray. Not all stones react this way but some will. When it does, it will generally take 24-48 hours before the discoloration disappears. So, the only downside is that you may have to come back after a few days to take some good "after cleaning" pictures. does heat matter when cleaning gravestones? Here in Wisconsin we've had a very hot summer...we're talking about several days in the 90s with heat indices over 100. 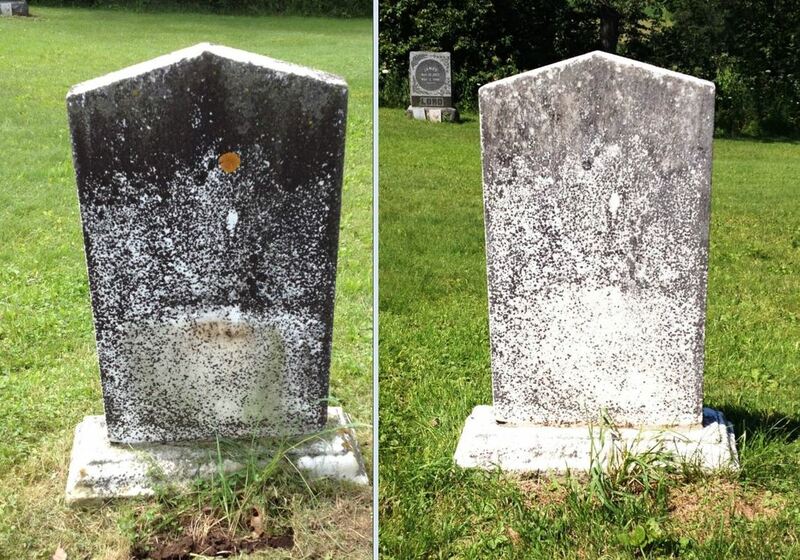 Should you clean gravestones in such extreme weather? 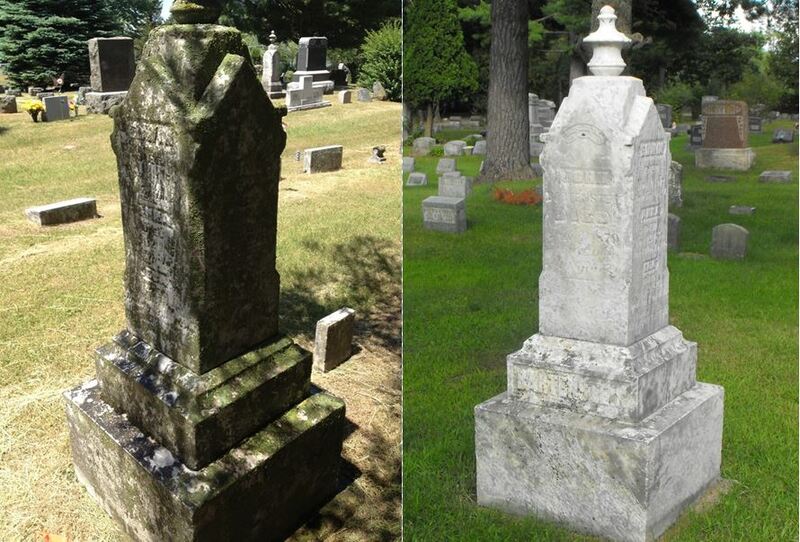 When it comes to cleaning dark colored gravestones, the answer is "probably not." I'm not even addressing the fact that doing any physical labor when it's that hot outside is dangerous here. I'm just addressing a question I get about cleaning gravestones during extreme weather. The type of gravestone you should avoid cleaning on hot, sunny days are the black, granite ones. These are the grave markers that are hot to the touch. If this is the case, you should NOT clean them. Why? According to Jason Church, materials conservator, for the National Park Service (NCPTT), the liquids you are using to clean may react with the surface finish of the granite, permanently damaging it. No one wants that to happen. Remember our guiding principle when cleaning gravestones? Do no harm to yourself or the grave marker. What about light colored gravestones or those which are non-granite? I would suggest avoiding cleaning those too if they are hot to the touch. Just wait for a cooler time of day or for a more mild day. Learn how to Preserve and Restore Tombstones! 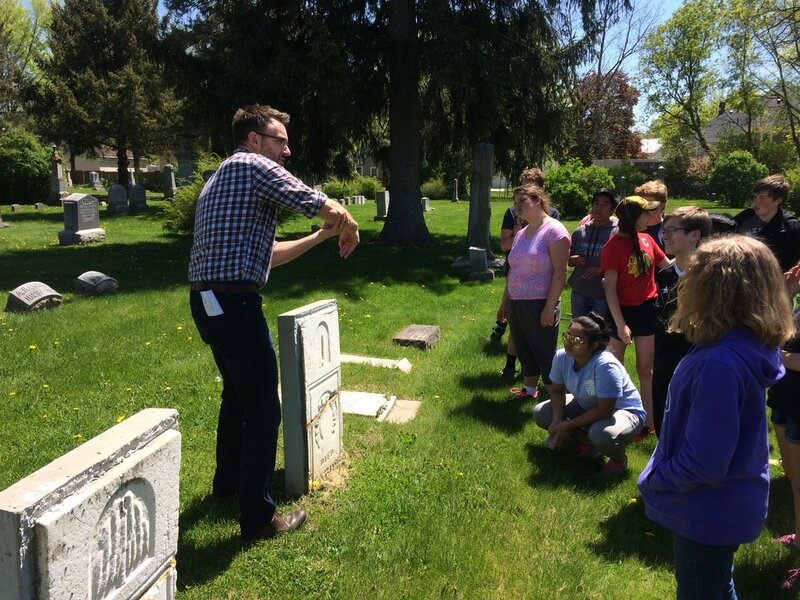 Jarrod Roll, founder of Save Your Stones and a local history professional, will lead a full day workshop on tombstone preservation and restoration. Participants will receive their own preservation kit (a$25 value), and lunch is included in the program cost. The program consists of a presentation at the History Center, followed by a hands-on workshop at Oakwood Cemetery in Red Wing. Cemetery professionals, genealogy enthusiasts, and local history buffs won’t want to miss this engaging and informative program. Registration, through Red Wing Community Education, is $38 per person and includes a professional preservation kit and lunch.